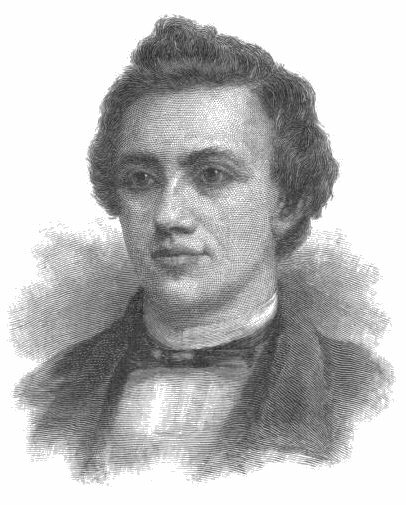 Extensive information about Paul Morphy (1837-1884) and his unquestioned status as one of the greatest chess masters not only of the 19th century but of all time can be found on several chess related web sites. The first of seven sequential youTube videos telling the full story of Paul Morphy in the form of great 19th century period photographs and pictures set to music is found below. The story continues at the end of the first video by clicking later parts or click here to locate the other six videos. Another remarkable and very detailed multi-part biography of Morphy by the chess.com blogger “batgirl” so extensive that it includes such topics as his ancestry, childhood and school days can be found by clicking here. 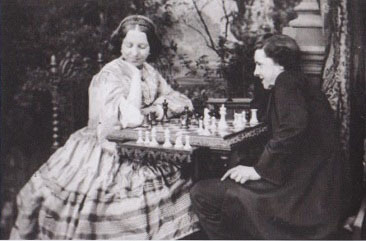 "Batgirl" describes the story of Paul Morphy as “…the story of the birth of modern chess…”. Most people familiar with the game and its history would agree. Born in New Orleans, Morphy learned the game watching his uncle and father play. He was considered to be a chess prodigy by the age of eight. It is said that General Winfield Scott had to be convinced it was worth his time to play an eight year old child. Morphy beat the general twice. At the age of twelve Morphy checkmated the French chess master and New Orleans champion Eugène Rousseau in just 17 moves! Rousseau was considered to be the second best player in America at the time. Morphy’s father mailed the game to International Chess Master Lionel Kieseritzky. Morphy’s fame began to grow. In 1851 Kieseritzky published Morphy’s 17 move victory game against Rousseau in his chess journal “La Regence”. For those interested in seeing that 17 move Morphy victory played before your eyes click here and then click the > button at the bottom of the chess board, when it appears, to advance the chess pieces through all 17 moves. For a site described as the “first comprehensive and computerized Morphy game collection containing all of Morphy’s 415 surviving games” click here. 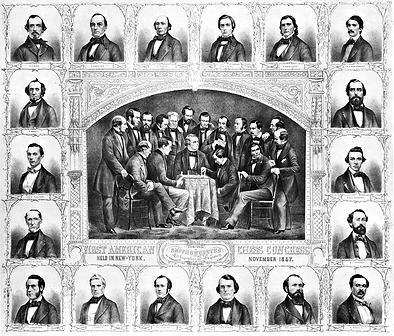 The Inaugural Chess Congress was held in New York in 1857 when Morphy was only twenty years old. At the time it was the strongest chess tournament in American History. The Inaugural Chess Congress tournament took place in the sumptuously decorated Descombes Rooms on Broadway, New York City. Among those competing were the American Chess champion Charles Henry Stanley, New York State Champion Samuel Calthorpe, New York Chess Club Champion Napoleon Marache and the German Chess Master Louis Paulsen. 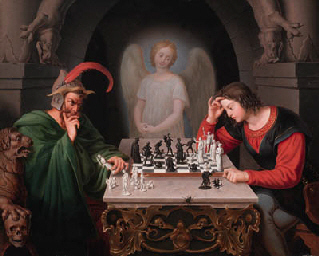 In the center of the above group portrait, Morphy makes a move in an endgame with Louis Paulsen. Morphy successfully moved through the first three rounds achieving a combined score of 9 wins no losses and one draw. The final round of the tournament was played between Morphy and Paulsen. One of those final games lasted 15 hours reportedly because Paulsen moved so slowly. Morphy dominated Paulsen winning 5 games, losing only 1 and achieving a draw for two games. For an interesting biography of Morphy written by “an Englishman” two years after the author had the occasion to meet Morphy at that New York Inaugural Chess Congress in 1857 see “Paul Morphy, The Chess Champion” by Frederick Milnes Edge published by William Lay, London 1859. The book was digitized by Google and can be read on line beginning here. Morphy had beaten some of the strongest players in the world. 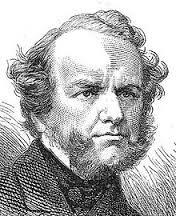 News of his achievement reached the then World Chess Champion Howard Staunton in England. 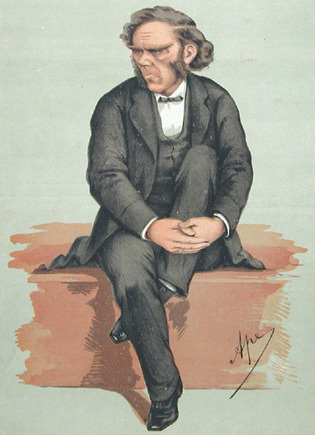 Morphy traveled to London in 1858 with the intention of playing Staunton. Staunton agreed to the match and published the terms in the London Illustrated News. The match would consist of “21 games for a stake of 500 pounds”. 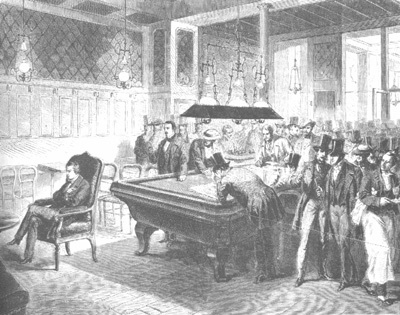 At Queens College in Birmingham England, while waiting for Staunton to name a date for the match, Morphy played eight Chess Masters at the same time. 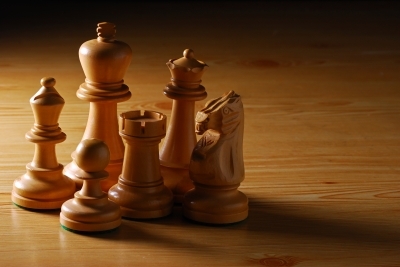 They were led by Lord Lyttelton, President of the British Chess Association. Morphy won 6 games lost only one and tied another. The achievement understandably shocked the British Chess World. Staunton had not yet named a date for their chess match so Morphy sailed to France. While there he gave an eight board blind simultaneous exhibition against members of the chess venue Café de la Régence sitting alone for 10 hours. He scored six wins, no losses and two draws. He eventually won a repeatedly delayed match against the Café de la Regence champion Daniel Harrwitz. Morphy was the toast of Paris and accepted an invitation from the King and Queen of France, the Emperor Napoleon III and Empress Eugenie. In 1859 Morphy returned to London. Staunton refused to follow through with their intended match. That same year Morphy was invited to a private invitation with the Queen Victoria of England. It was reported that in the garden at Buckingham palace Morphy gallantly let the Queen win their game. Back in Paris in 1867 for the International exhibition and Chess Congress Morphy was rumored to play but only visited with family and friends. 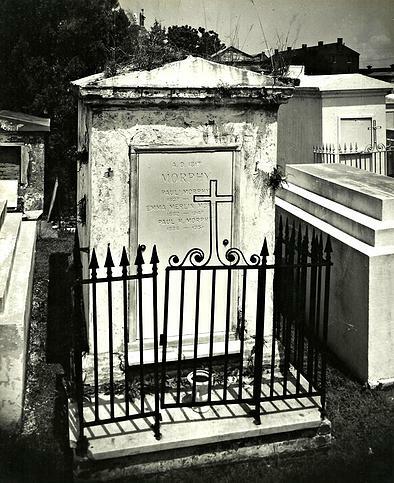 He died in New Orleans on July 10, 1884 and was buried in St. Louis Cemetery No.1. Morphy's legacy to the game of chess was extraordinary. Chess master Adolf Anderssen said of Morphy “I consider Mr. Morphy the finest chess player who ever existed.” Emanuel Lasker is quoted as saying “No one ever was so far superior to the players of his time.” And the great chess champion Bobby Fischer is reported to have said the following of Morphy “Perhaps the most accurate chess player who ever lived”. If there was anyone in the 19th century capable of assuming the board position of the young man in Moritz Retzsch's famous chess match with the Faustian figure of Mephistopheles and beating the Devil at his own game it was Paul Morphy. For details of that story click here.